Conference organizing is not for the faint of heart! 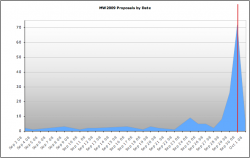 Proposals are now out for peer review by the MW2009 Program Committee. You've given them a difficult task, and we're very grateful for their assistance. Watch for the results of their deliberations and the announcement of the preliminary program in mid-November.